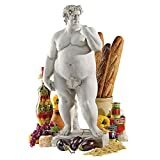 If Michelangelo were to sculpt the famous statue of David today in this 21st century world of fast food, overeating, and sedentary lifestyles, it might have come out something a bit more like this cool new Super-Sized David Statue. This portly sculpture of David is hand-cast in quality designer resin, comes complete with a modesty fig leaf, and is perfect for displaying inside or out. Trying to lose weight? Put it in the fridge as an effective snacking deterrent.